With a population of over 650 million people and an average growth rate of 5.1%, South East Asia sits at the heart of Asia Pacific, and with trade links to all of the world's major economies, is projected to be the world's 4th largest market by 2030. South East Asian countries already account for more than £32 billion of trade with the UK, 2016 figures show (ref: Department for International Trade). The Chamber can assist your company at every stage of your journey, from initial market research through to growth, brand positioning and extending employee benefits. Our range of Member Benefits can be utilised at the most appropriate stages your company's development and we offer a variety of Membership Types to suit your scale, with options to upgrade in proportion to your growth. Join the Chamber today. To provide members with a channel to reach into South East Asian markets, we actively engage with British Chambers and Business Groups in the South-East Asian region. The geographic spread of the network provides a strong business community in the region, giving members who are already established or intend to establish themselves in South East Asia a validated third party contact to provide representation, services, information and guidance. 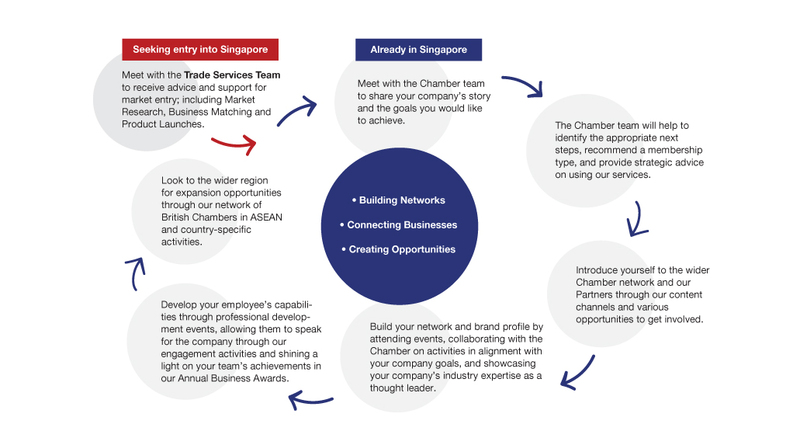 Members of the British Chamber in Singapore are entitled to member rates for events hosted by the regional Chambers around ASEAN on request. Created out of UK Trade and Investment's (now the Department for International Trade) 2011 strategy 'Britain Open for Business' the UKABC is passionate about helping UK companies of all sizes export and invest in one of the most exciting, vibrant and fastest growing regions in the world. Working closely with the UK and ASEAN Governments, key partner organisations including the British Chambers of Commerce in ASEAN, influential corporates, experienced SMEs, market experts and professional services providers, they have created an extensive UK-ASEAN business network that allows them to provide unique market insights, and links UK innovation and expertise with ASEAN's vast commercial developments. For more information visit www.ukabc.org.uk/. The Britain Brunei Business Forum was founded under the patronage of the British High Commission in Brunei to enable British and Bruneian business people to meet together in order to further trade. BBBF assists Bruneian business people in finding British partners for enhancing both parties business performance and circulates information about opportunities for business with Britain through the Bruneian business community. The forum provides a diverse and inclusive network to build opportunities for British, international and local organisations in Brunei with ties to British business. For more information visit www.britbrubus.com. The British Chamber of Commerce of Cambodia (BritCham Cambodia) was founded as the British Business Association of Cambodia in 1995 by Senaka Fernando MBE. In 2013, it was officially registered as a Chamber of Commerce with the Cambodian government. They welcome all individuals with an interest in the UK and Cambodia. The Chamber currently has over 100 corporate and individual UK, international and national members. For more information visit www.britchamcambodia.org. The British Chamber of Commerce has been established since 1999 and builds on a British business presence that extends more than a hundred years. Over those years, they have had the pleasure of welcoming the most influential politicians, business leaders, world commentators, renowned experts in various fields and academicians as guests to over various forums. Each year, they host more than one hundred events that provide broad platforms for business development amongst their members. For more information visit www.britcham.or.id. The mission of the BBGL is to represent and support the commercial interests of its British, Lao, and international members by acting as a platform to create and promote business opportunities within the working community. The BBGL encourages trade and investment between Lao PDR and the UK, regularly sharing relevant content from both countries. For more information visit www.bbglao.org/. Established in 1963, the British Malaysian Chamber of Commerce (BMCC) has been driven by the sole ordinance of advancing bilateral trade relations between the UK and Malaysia. Over the past five decades, the BMCC has been a catalyst in providing Malaysian-based businesses with networking and exposure, knowledge exchange and bilateral trading support services. Today, the BMCC has firmly rooted itself as one of Southeast Asia’s most prolific Chambers. For more information visit www.bmcc.org.my. The British Chamber of Commerce Myanmar is an independent, non-profit membership organisation which aims to promote, support and represent business interests in Myanmar. The organisation launched in July 2014 with the support of high profile British businesses - four Founding Patrons: Shell, Jardines, Prudential and Standard Chartered Bank. For more information visit www.britishchambermyanmar.com. The British Chamber of Commerce Philippines (BCCP) is an independent, non-profit membership organisation whose primary objective is to support the development of its members’ business and social interests in the British and Philippine communities, helping them achieve their objectives. Founded in 1997 as the British Business Association, they became a British Chamber of Commerce in 2001. Today, they represent over 270 member companies and individuals with a membership network of over 600 entrepreneurs and senior executives of multinational corporations and SMEs. For more information visit www.britcham.org.ph. Founded in 1946, the British Chamber of Commerce Thailand (BCCT) is the oldest foreign chamber and the largest non-Asian foreign chamber in Thailand. In addition, it is the largest and oldest British Chamber in Asia. At its inception there were 17 founding British members and three associate members. The BCCT has a seat on the Board of Trade of Thailand and is active in representing members’ interests on the Joint Foreign Chambers of Commerce Thailand. BCCT is actively supporting the establishment of the European ASEAN Business Centre in Thailand. The British Business Group Vietnam (BBGV) started as a luncheon club in 1991 and was first licensed in 1998. They were the first ever Foreign Business Group to obtain formal recognition in Vietnam. The BBGV now boasts more than 450 members. BBGV’s main objective is to promote their members’ business interests in Vietnam, through various business and social events.